So anyways, the Boy wanted to make fried spring rolls, and once we got underway, realised that we had Wan Tan skin instead of Spring Roll skin (rice paper), decided to go full steam ahead anyway. This is from a Vietnamese (fried) Spring Roll recipe, and it did turn out gorgeous!! I took too many pictures and am too lazy to put them up and explained them all, so I did what all lazy people do, and compiled them into a single frame (most of it anyway). 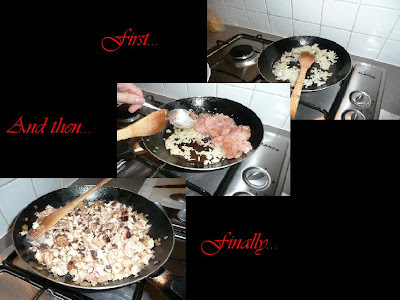 Firstly, heat up some oil and then add the onions, followed by the chicken, prawns, crab meat and finally with the mushrooms. Add in a mixture of 2 tablespoons of Oyster Sauce, 1 tablespoon of Soy Sauce, 1/4 cup of Chicken Stock and 1 teaspoon of Sesame Oil. 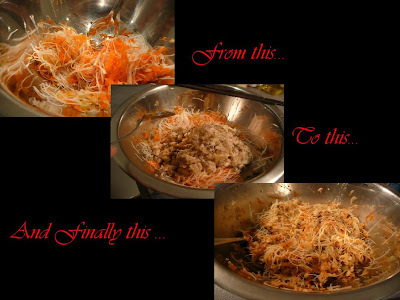 Mix the diced celery, carrots and vermicelli together. And when the cooked ingredients have cooled, add into the mixture and mix well. I forgot to take a picture of the wan tan making process (as my hands were covered with corn starch)… but it’s simple and just have fun! Cook each wan tan until it turns golden brown, remove and drain on paper towels. The wantan looks so good!! 😛 Havent had this for a while now. Wah…your wantan a lot of work lah but…Hmmm with crab meat, carrot, mushroom. The ultimate level ! Melanie – Yes it was really yummy! 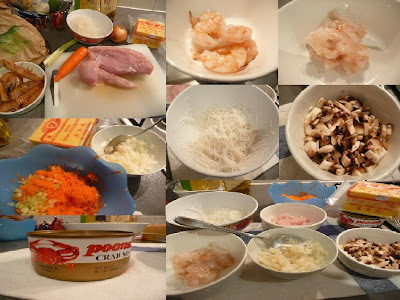 NyonyaChef – It was a lot of work, but also a lot of fun.. and tasted really good!! I will I will post soon.. but I've got other food that's more interesting looking than siu yuk!! !